Speed Driver 4: World Fever is an exciting arcade driving machine game from IGS in which players can compete with rivals across the globe through online play. 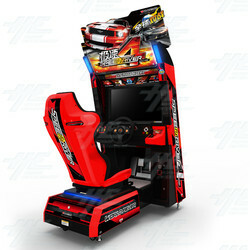 Speed Driver 4 is a single seat cabinet which can link up to 3 other units for multiplayer action! This fun driving game comes with new tracks, new cars, new characters and new BGM's to delight players of all skill levels. New tracks include 'Sightseeing TUNL', Huangpu Bund', 'Nanpu Bridge' and 'Southern Shanghai'; and new cars include 'Storm', 'Djinn', 'Mighty', 'Duke', 'Venom' and an extra mystery vehicle to unlock. The game modes players can select from in Speed Driver 4 include, 'Global Battle Mode', 'Local Battle Mode', 'Free Racing Mode', 'Story Mode', 'Time Attack Mode' and 'Challenge Mode'. Speed Driver 4 is a single seat cabinet which can link up to 3 other units for multiplayer action! This fun driving game comes with new tracks, new cars, new characters and new BGM's to delight players of all skill levels. New tracks include 'Sightseeing TUNL', Huangpu Bund', 'Nanpu Bridge' and 'Southern Shanghai'; and new cars include 'Storm', 'Djinn', 'Mighty', 'Duke', 'Venom' and an extra mystery vehicle to unlock. The game modes players can select from in Speed Driver 4 include, 'Global Battle Mode', 'Local Battle Mode', 'Free Racing Mode', 'Story Mode', 'Time Attack Mode' and 'Challenge Mode'.